The this years Vietnam Funcup, it will be the 11th edition, will be a tough one. I could win the race last year. It was the 10th time, that the event happened. In the upcoming competition, which will take place on the 29th and 30th of January for the very first time a Pro division will be held. The organizer Pascal Lefebvre just sent me a mail today: Remi Vila, Cyril Moussilmani, Jimmy Diaz, a couple of Russians,Â 2 Vietnamese and yourself are on the starting list of the Pro division in the moment. Wow! It looks like I will have a great slalom competition there! LetÂ´s hope that the wind will kick in, but so long the north easter worksÂ great in this season! The good thing about the event is that you meet many happy people having fun on the water, a great party plus concert will be up and all the profit of the event will be donated to a charity organization in Binh Thuan Province. Vietnam, we come!! Kerstin and myself should arrive there on the 26th of January! 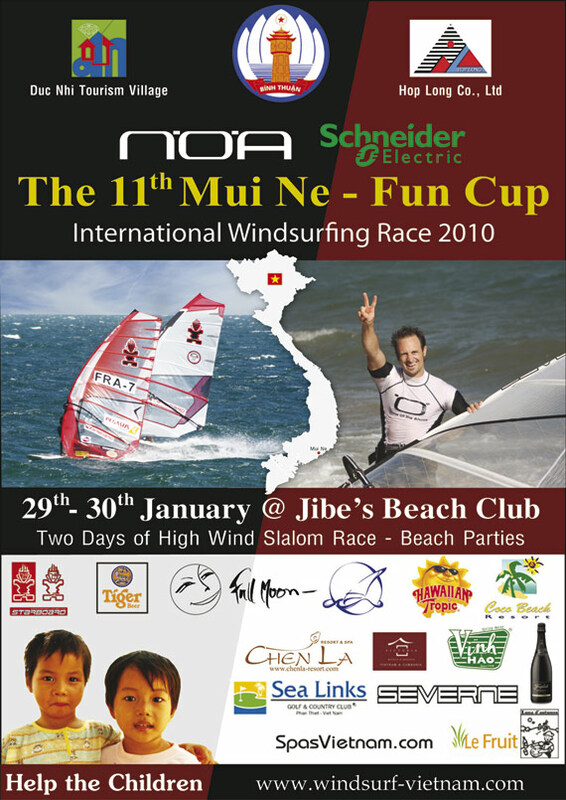 The Vietnam Funcup poster 2010 (Pic: windsurf-vietnam.com).